KouKOfava (κουκόφαβα) or fava bean spread originally hails from the island of Crete and is a positively delicious, incredibly nutritious and absolutely beautiful spread made from fava or broad beans. 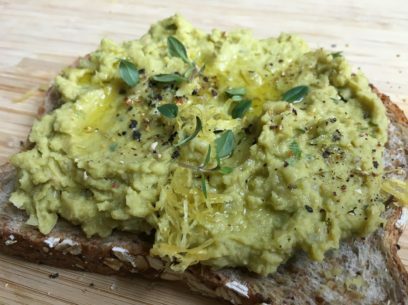 Each bite of fava bean spread comes with a natural boost of B vitamins, plant protein, minerals, anti oxidants and fiber. 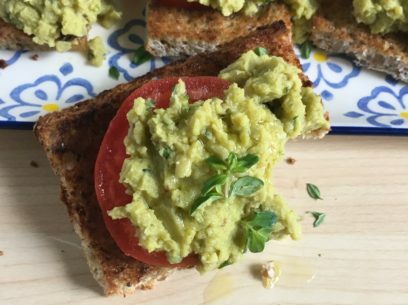 I absolutely LOVE it on everything but most especially, on toasted multigrain bread drizzled in olive oil. Koukofava – the breakfast of real champions! 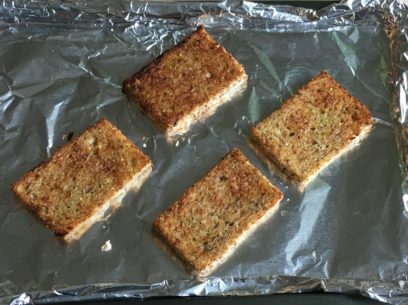 multi grain bread toasted under the broiler! My go-to for fava beans is Melissa’s Produce steamed fava beans. Just cut open the bag, drain and use – see why they’re my go-to? Oh, of course, they’re also fresh and delicious beans too! There are also plenty of good frozen options that simply need to be thawed on the counter for usually less than 30 min and you can always go with dried fava or broad beans. Fresh beans are hard to come by in my neck of the woods, I might bump into them once or twice a season so the steamed, frozen or dried options are for me. just whiz ingredients together and you’re good to go! again – apologies for photo exposure! Something to note: in traditional Greek cooking, fava beans are used with the peels on in almost all recipes. 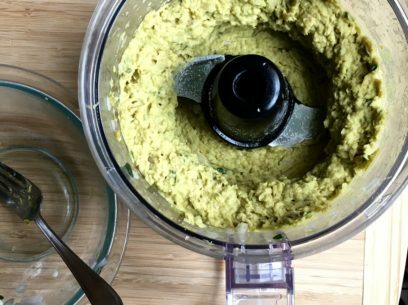 Thing is, I have never found UN-peeled fava beans either dried or frozen SO both the fava bean and artichoke stew and this fava bean spread call for peeled beans. It took a little bit to realize, when working on this recipe for TGV, because authentic Greek cooks in Greece use peel-on fava beans, our recipe with peeled beans had less bulk to soak up the olive oil called for so the trickiest part of the conversion was getting the olive oil quantity right. An exact third of a cup gives the most perfect, chunky, velvety, satisfying spread ever. In medium bowl, combine all ingredients – except olive oil – and stir gently to combine completely. Transfer ingredients to bowl of food processor and pulse a few times to combine. Scrape down sides of bowl and add olive oil. Process for between 30 seconds to 1 minute depending on your desired chunky-ness or creaminess. This looks delicious! Can’t wait to try it this weekend! Oddly enough when i was in Crete last month the restaurants were serving FAVA bean spread that was made from yellow lentils– no joke. fava (φαβα) is amazing, made from yellow split peas, but a different dish entirely. I just returned from a trip to Greece. They served a delicious fava dip EVERYWHERE but they used yellow split peas. They never used actual fava beans. Looking forward to recreating many of these. Hi! I’m looking forward to make this, can we keep it in the fridge? for how long? I made this recipe, I used frozen beans, really easy to do and very tasty. I spread it on homemade Spelt bread, so Greek and Roman culture! I also drizzled Greek Kalamata Olive Oil over it, so delicious.